Experts from the around the world gathered at a Proton Therapy Symposium held at the Rufaida Building, sponsored by SAH Global, to discuss the clinical effectiveness of proton therapy in cancer treatments. The symposium presented clinical advances to world renowned physicians and innovators in cancer treatments and fostered discussions on using those developments to improve patient outcomes. The symposium’s welcome address was delivered by Dr. Aisha Mubarak Buanq, Undersecretary of the Ministry of Health. The keynote speaker at the symposium was one of the world’s leading oncologists, Allan Thornton, MD, who serves as the Chief Medical Officer for SAH Global. He is considered to be one the world’s best cancer physicians and a global leader in the research and development of proton therapy. Dr. Thornton is sought by leading hospitals worldwide for his expertise in highly complex clinical cancer cases. 1- Incorporating the appropriate sequence of chemotherapy/surgical/radiological intervention for solid tumors into patients’ proton therapy plans in order to improve outcomes. 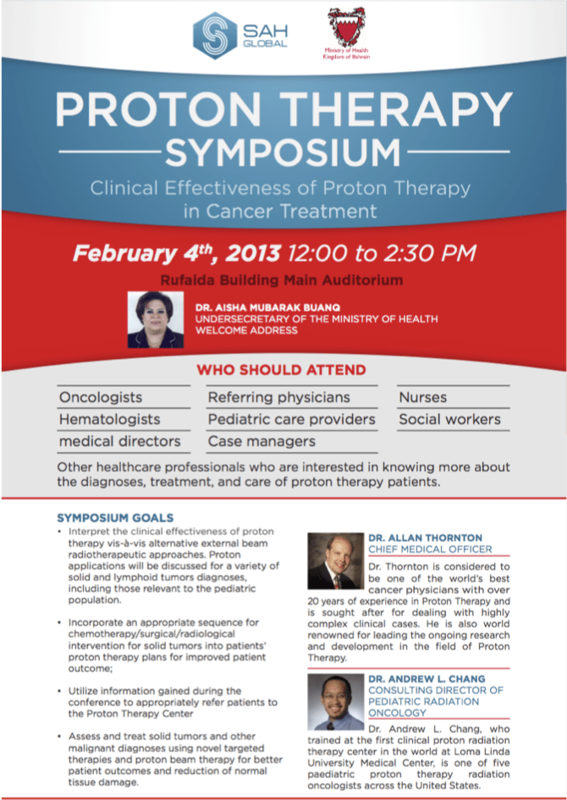 2- The assessment and treatment of solid tumors and other malignant diagnoses using novel targeted therapies and proton beam therapy for better patient outcomes and reduction of normal tissue damage.